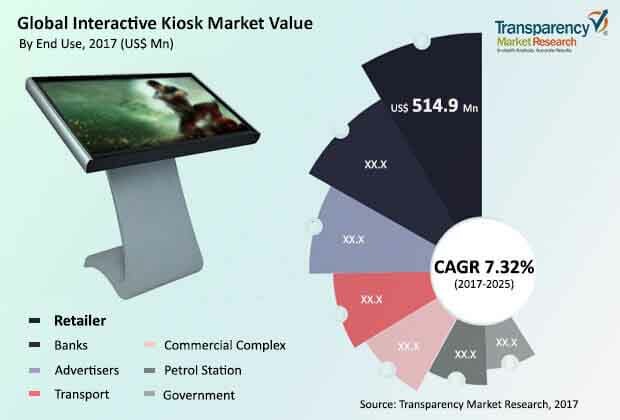 As per the evaluations of a recently compiled business intelligence report by Transparency Market Research (TMR) – the market for interactive kiosk will be worth 2,019.5 million by 2025, with the demand expand at a CAGR of 7.34% during the forecast period of 2017 to 2025. However, the competitive landscape is already considerably consolidated among the top dozen players while newer players are finding it hard to make a mark. As of 2017, the report has identified Acrelec, ZIVELO, Kiosk Information Systems, Olea Kiosks Inc., GRGBanking, Meridian Kiosks, Nautilus Hyosung, Kontron AG, Glory Ltd., Diebold, Inc., Fujitsu, Ltd., and NCR Corporation as the leaders in the global interactive kiosks market, collectively reserving 78.1% of the total shares. Among these, Diebold, Inc., NCR Corporation, and Fujitsu, Ltd. have been highlighted as the only three companies who held more than double digit of shares percentage. The analyst of this report on the interactive kiosk market has detected that Diebold Inc. provides connected commerce services, software, and technology in North America, Asia Pacific, Europe, Middle East & Africa, and Latin America. It offers financial self-services, retail solutions, and security systems. Business expansion by acquisition is the key strategy adopted by Diebold, Inc. The company’s another major strategy is to achieve non-organic growth. It was clearly visible when Diebold, Inc. acquired Cryptera, one of the leading R&D companies in secure payment technologies. Based on end use, the report segments the interactive kiosk market into transport including airport, railway, and bus operators, retailers, advertisers, banks, commercial complex including education and hospital, petrol stations, and government. Retailers has been identified as the key segment that is primed to generate more than 46% of the total demand by 2025, with its worth closing in to thousand million dollar mark. On the basis of type, the kiosk market has been bifurcated into ticketing, information, patient interaction, check-in services, employment, and bill payment. Among these, information kiosks and ticketing kiosks are foreseen to collectively generate nearly the half of the total demand by the end of 2025. Geographically, while North America is the most profitable region in terms of demand potential, Asia Pacific has been anticipated to increment the demand at the most prominent growth rate. The growing preference of customers in self-service and consequently, the great benefit of increased user engagement and overcoming the need for a human resource for the organizations is the prominent driver of the interactive kiosk market. Over a longer run, kiosks systems are cost effective and an efficient medium for streamlining monotonous business processes and hence, the adoption is increasing. On the other hand, substantial initial cost, rising incidences of cybercrime, growing usage of smartphone applications by the users, and the need for technological environment at the location of application are a few challenges curtailing the progress of the interactive kiosks market. The analyst of the report has foreseen that the trends of navigational kiosks, solar kiosks, and card-less ATMs will open new opportunities in the near future.